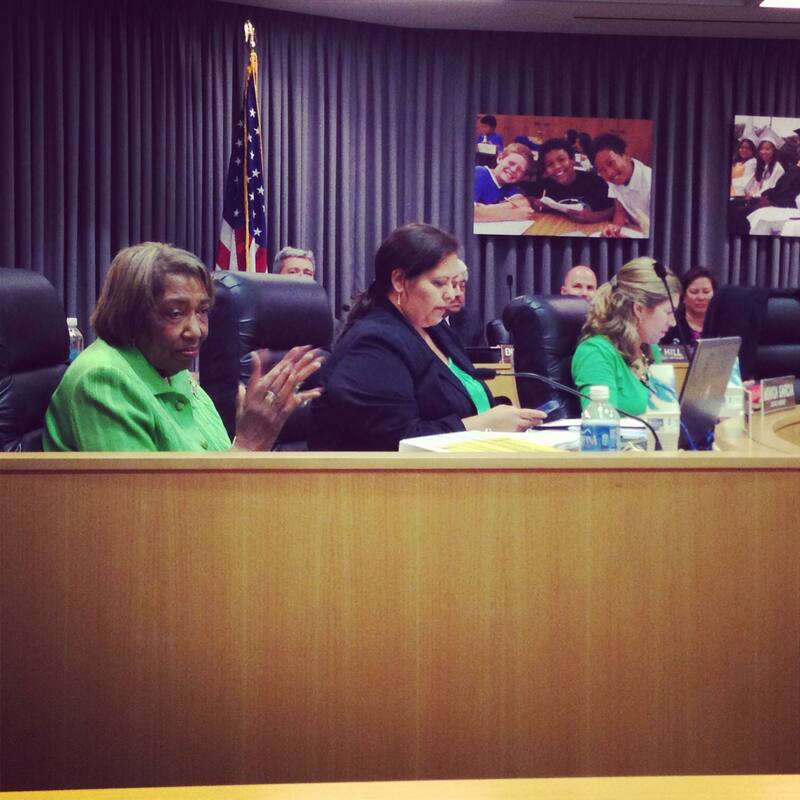 August 20, 2013 :: What began as a breezy LA Unified School Board meeting on Tuesday turned, not surprisingly, into a long, tedious, sometimes rancorous session, with a host of issues discussed but rarely resolved. A number of key votes were postponed, and Superintendent John Deasy‘s highly anticipated budget presentation was postponed until the Sept. 10 board meeting so it could be considered in the broader context of the 2013-14 budget. • One new feature of Richard Vladovic‘s newly begun presidency (aside from creating a number of new committees) was to order senior staff, including instructional superintendents, to attend board meetings. In many cases, when public commenters brought issues to the school board, Vladovic urged the visitors to meet, on the spot, with the district staffers. • The Board debated the $113 million budget for implementing the new Common Core State Standards — although voting on the budget was postponed until next month. LAUSD Chief Academic Officer Jaime Aquino pointed out that roughly 75 percent of the budget is set to go toward helping teachers. Teachers union President Warren Fletcher was none too pleased. A recent online survey by teachers union members showed that teachers feel unprepared for the Common Core transition. UTLA Vice President Gregg Solkovits struck a more conciliatory tone, saying he was speaking on behalf of ”classroom teachers who are not afraid to embrace the Common Core standards.” He urged the board not to rush its implementation. Deasy said that there was “real wisdom” in that comment and pointed out that the district’s plan is to take four years to transition to the new curriculum. • The deal to hire Thelma Melendez de Santa Ana and loan her to Mayor Eric Garcetti‘s office and be reimbursed by the city was approved unanimously without discussion. • Another charter co-location dispute arose, this one between Lorena Street Elementary and Extera, a charter operator. Charter schools can be forcibly co-located with district schools thanks to Proposition 39, and a court ruling that says all empty classroom space must be given over to charter schools. LAUSD is currently fighting that ruling – in fact, chief counsel Dave Holmquist said the district is filing a brief with the Supreme Court of California on Wednesday. The dispute spurred board member Steve Zimmer to ask that the board direct the superintendent’s staff to lobby the state to suspend Prop 39. That motion will be voted on next month. • Member Bennett Kayser‘s motion to convene public input meetings and establish budget priorities passed 5-1, with Tamar Galatzan voting no and Monica Garcia absent.